Address hoof problems at the source. This coronet soaker is designed to be used with Hoof Alive. This application system promotes healthy growth from the source of the hoof and allows Hoof Alive to penetrate the hoof wall from the top down. The coronet soaker helps you treat severe cracks and extreme dryness. Hoof Alive Coronet Soaker contains 2 soakers. 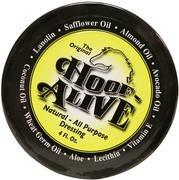 All natural Hoof Alive can be used all over your horse. 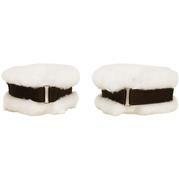 It uses natural ingredients that penetrate the hoof and become a part of the living tissue, including the hoof wall. Hoof alive can also be used for conditions such as rope burns, cinch sores, abrasions, and cuts. Hoof Alive contains avocado oil, coconut oil, lanolin, glycerin, safflower oil, almond oil, wheat germ oil, aloe, lecithin, and vitamin E.
All natural Hoof Alive is designed to penetrate through the hoof wall and all other live tissue. It contains lanolin, glycerin, coconut oil, safflower oil, almond oil, avocado oil, wheat germ oil, aloe, lecithin, and vitamin E. Hoof Alive restores moisture, integrates into the hoof wall, and makes hoofs virtually impervious to the elements. This product is safe for use on almost all parts of your horse. 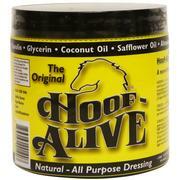 Hoof Alive can be used to treat saddle sores, abrasions, rope burns, cinch sores, cuts, and many more conditions.